Once upon a time, not so many moons ago, Croydon’s high street just beyond the strip, appeared to have lost its buzz. Aside from Surrey Street Market and Matthews Yard, there seemed to be little reason to venture to the area. Skip, hop and a jump to today and the area is thriving. From gamers’ paradises, such as Ludoquist and Limitless VR to Craft Beer lovers, Art and Craft, choice is something we are no longer lacking. The streets are decorated with art and we have a mighty fine supply of great coffee and lunch spots. One such place and newbies to the high street collective, is Coffee Shotter. The coffee is a thing of beauty, but don’t be fooled by the name, there’s more to this place than coffee. We were pleasantly surprised to discover that Coffee Shotter is a vegan and vegetarian café with a mouth watering supply of doughnuts with a twist. More about the doughnuts later though. Lunch options are plentiful. Expect the usual suspects of falafel and bean feasts, but there’s also a whole range of tasty options packed with flavours. The Mexican Pancake is a winner and it’s Vegan too. Red Peppers, beans, kale, leeks, onions and a kick of chilli and garlic fill the pancake removing any doubt about vegan food lacking in taste and satisfaction. Also on the menu is a lentil special, spicy soba noodles and a range of different and tasty salads, freshly prepared each day by Laura’s Idea. They’ve been going for decades and it’s easy to see why. The pairing of their food with the café is a smart move indeed. Onto desserts. Yes there are vegan and vegetarian options such as guilt-free truffles (vegan) and chocolate cheesecake, but it was the doughnuts that caught my eye. 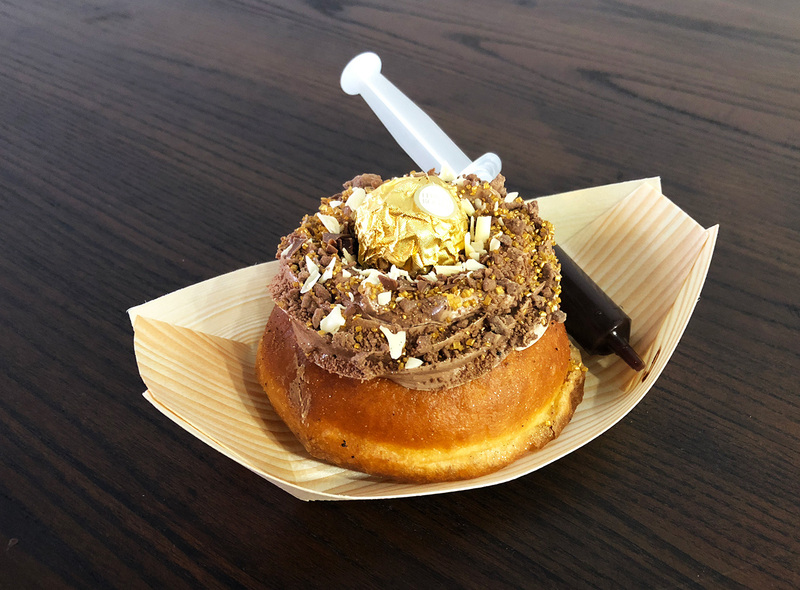 Light and fluffy brioche with mouth-watering toppings, such as Crunchy Bar and Ferrero Rocher, are enough to lure you in, but I mentioned a twist didn’t I? 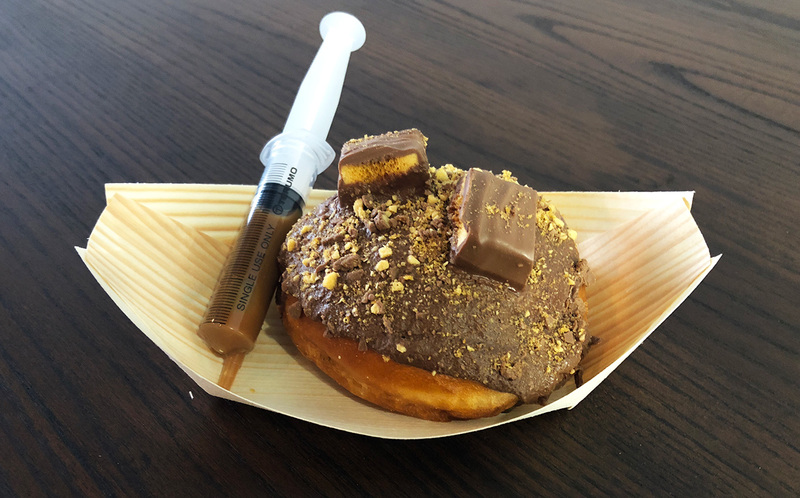 Be Right Bake (the gourmet geniuses behind the scenes) have allowed for customers to choose their own filling, which is then served in a syringe for you to inject into your donut, or straight in your mouth… when no one’s looking. When we stopped off for a spot of lunch we had a chat with Mark Sarfo-Kantanka, part of the Cellardoor Group that brought us Lost Format Society and now Coffee Shotters. Croydonist: Why a vegan and vegetarian café? 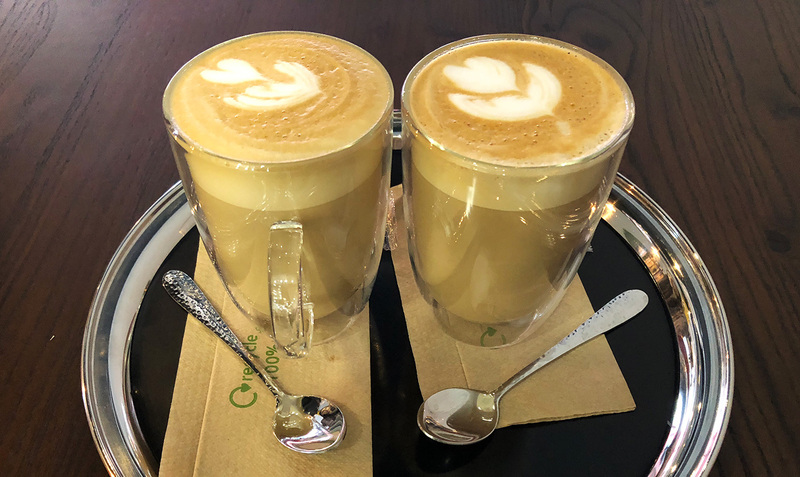 Mark: There are some great coffee / sandwich shops around us including Stuffins, Byte Café, Smoothbean, Crushed Bean and more recently Croydon has welcomed Limitless VR and The Ludoquist to the high street. With us all being independents, each individual shop has their own characteristics and therefore appeal to different customers, so it is great to join this community of business owners. 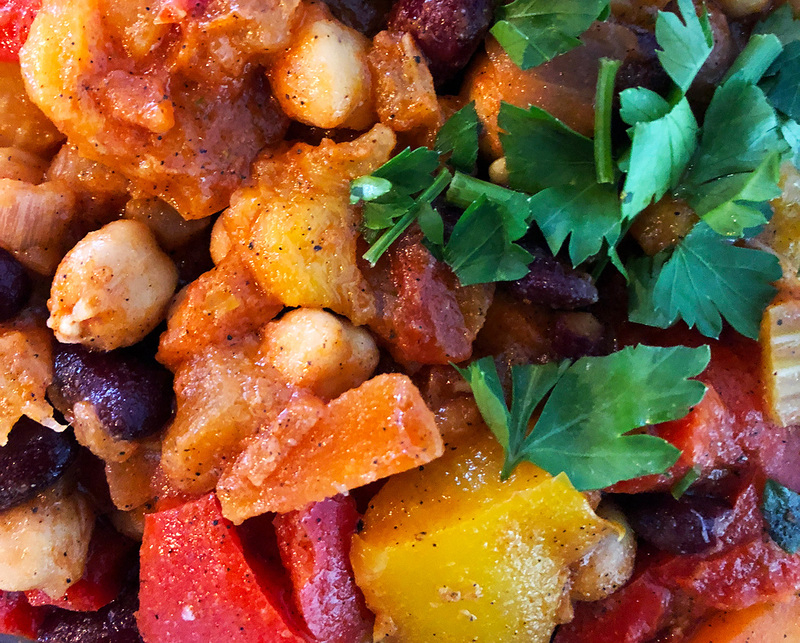 By focusing exclusively vegan and vegetarian chilled light bites, this means we can provide a wider offer. We have only been open four weeks but we have had a great response thus far. Over the next couple of months we will be increasing our range of food further with the aim that Coffee Shotter becomes a destination for plant based food in south London. Whether someone is a meat eater or not, we want Coffee Shotter to provide vegan / vegetarian food options that are just as tasty. Alongside the food options, we have to deliver top of the range coffee, which is why we invested in the best machine in terms of production from Kees van der Westen. We are also working with Horsham Coffee Roaster, which has ethically sourced coffee from Rwanda. We also encourage our customers to try our own Coffee Shotter blend, which has gone down a treat! Croydonist: Who else is involved – is it the whole Lost Format gang? Mark: Cellar Door is a Croydon events based company and having lived here all our lives, we wanted to bring a unique offer to the high street. Under various guises we have been running events in Croydon since the 1999 / 2000! In 2015 together with our good friend from school, we set up another company called ‘The Croydon Creative’, where we launched ‘Lost Format Society’, the award winning rooftop cinema and bar. Coffee Shotter however sits under Cellar Door. What you will get when you pop in is a warm welcome from our team of Laetitia, Esme, Kalu and Emily. Croydonist: Why do you think there is a trend towards veganism at the moment? Mark: Plant based diets are typical of pretty much most of the population. I believe what we are actually seeing more of is people making a conscious choice to remove meat from their palette. This is in large part a consequence of the over-production and intensive methods that has led to farming becoming a billion pound industry. The large supermarkets and squeezing their suppliers to deliver higher quantities for lower prices. So what we have now is a machine that people are consciously becoming aware of. Social media and greater access to different forms of news means that people can make better informed choices of what they consume. All that being said you will never find us at Cellar Door condemning meat eaters, which is where vegans sometimes get a bad name. Croydonist: What are your plans for the cool-looking space at the back? Mark: Coffee Shotter is the first phase that will soon see us opening up a co-working space for creatives called ‘Nexus’ at the rear. This will form the main purpose for the site. As creatives ourselves we understand the challenges faced when operating a business. We have seen the huge benefits that comes by fostering and providing an ecosystem for techs, which was championed by Jonny, Nigel and Sarah before the development of TMRW Tech Hub. What we aim to deliver with ‘Nexus’ is a space that allows creatives to grow together as a community, leveraging each others skill set whilst providing office facilities and professional support. Just through word of mouth we already have an ever growing list of creatives from various backgrounds including but not limited to music, art, fashion, film, theatre register their interest, so it’s exciting times ahead. Any interested parties can sign for details at www.cellardoornexus.co.uk ahead of our launch. 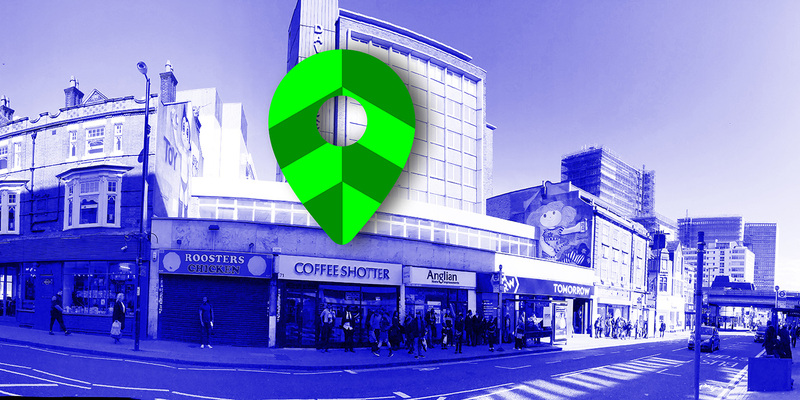 Coffee Shotter can be found at 71 High Street, Croydon. CR0 1QE. If you’re looking for great coffee, breakfast, lunch or an afternoon treat, you really can’t go wrong with a visit here.